STERLING SOUVENIER SPOON BKLYN BRIDGE ETC. STERLING SILVER SOUVENIER SPOON NEW YORK CITY. 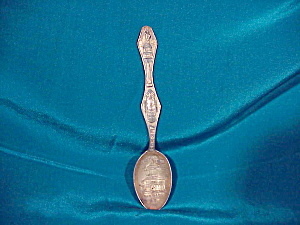 THIS 4 1/4" SPOON HAS GRANT'S TOMB EMBOSSED IN THE BOWL AND THE STATUE OF LIBERTY ON THE UPPER HANDLE, THE OBELISK AND THE FLATIRON BUILDING ALSO ON THE HANDLE. THE REVERSE OF THE HANDLE HAS THE BROOKLYN BRIDGE EMBOSSED ON IT. EXCELLENT CONDITION. BUYER PAYS SHIPPING AND INSURANCE. MONEY ORDER SHIPS NEXT DAY, CHECK MUST CLEAR.